Some of the paper on the platen is peeling, but most sections are pristine. This was a happy eBay find on a Sunday morning. The seller preferred local pickup, and I happened to be close by. 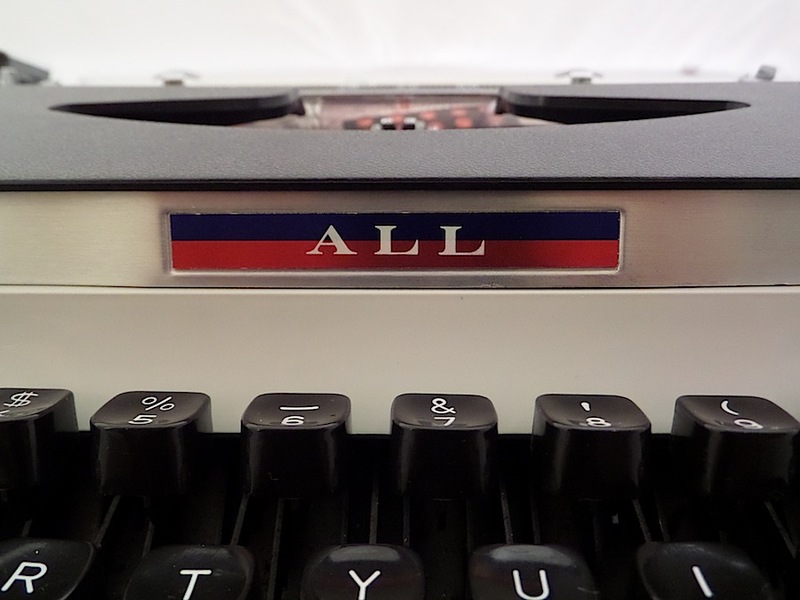 So, in one short day, I purchased, cleaned and created this blog post for my newly acquired Nakajima ALL portable typewriter. I’m not sure of the model number, though I’ve seen similar models called the 550 or 800. 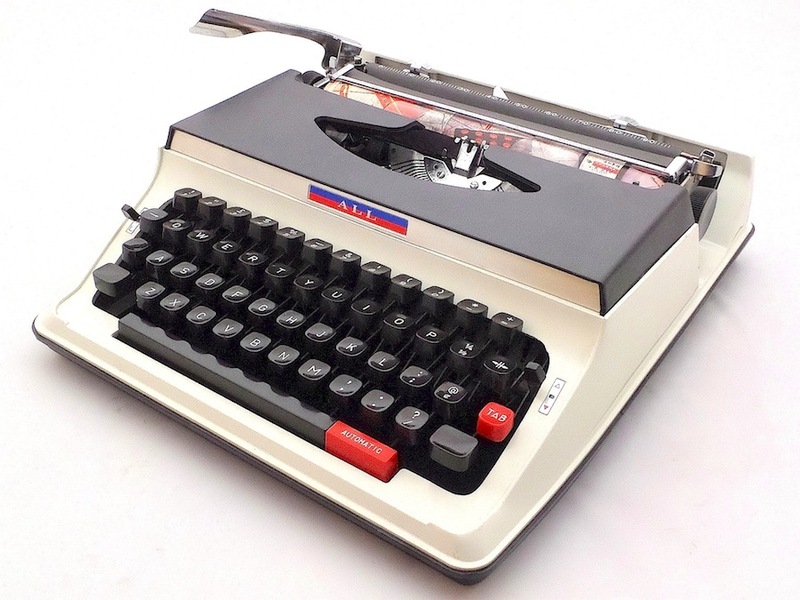 In 1968, monthly production of typewriters exceeded 15,000 units. 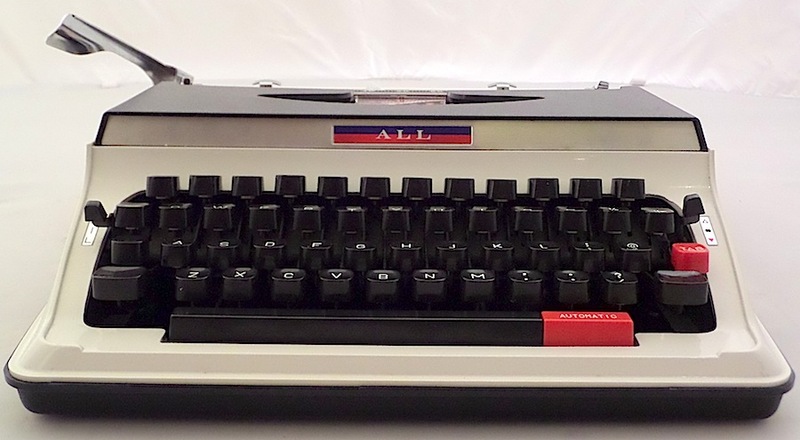 I’m guessing production of manual typewriters ran from 1965 to sometime in the early 1970s. 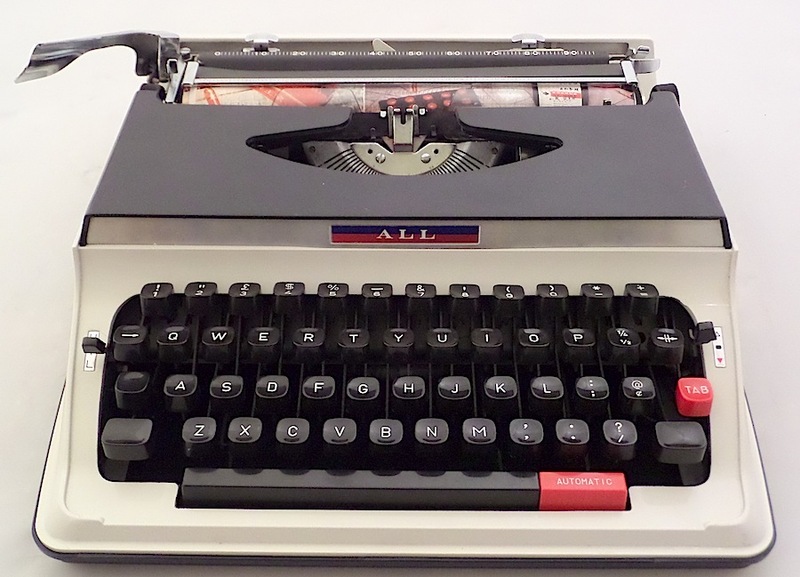 After 1971, the company seems to have marshaled all of its efforts to produce electric typewriters, and, later, computers. I’m not very impressed with the quality of the ALL. I gave mine a thorough cleaning — it was in decent shape to begin with — but it didn’t improve much. As you can see from the typecast above, the alignment is off a bit.4 The small “a” seems malformed, leaving a weak impression. My interest in this machine was piqued when I noticed decorations on the platen. It’s covered with a roll of glossy paper, featuring various images. Nakajima ALL must have used one continuous printed sheet, as peeling reveals additional images underneath. 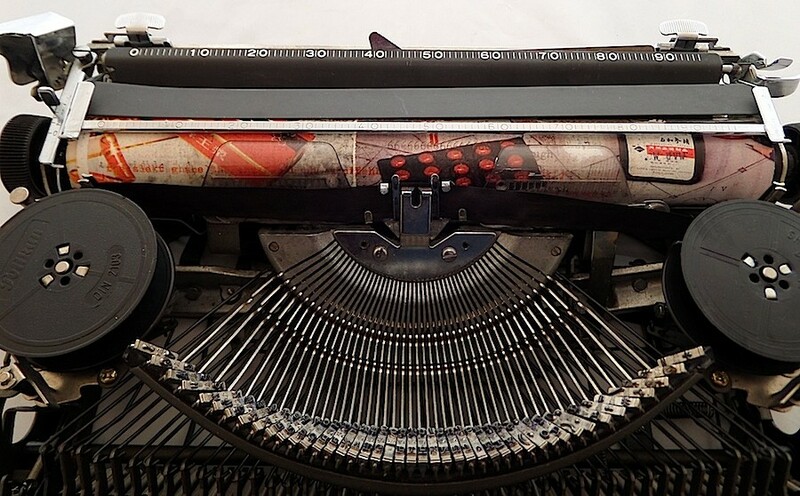 I’m not sure this material offers a fair typing surface. Perhaps that’s why (apart from my stubborn refusal to change the ribbon) it doesn’t leave a nice impression. How cool is that. 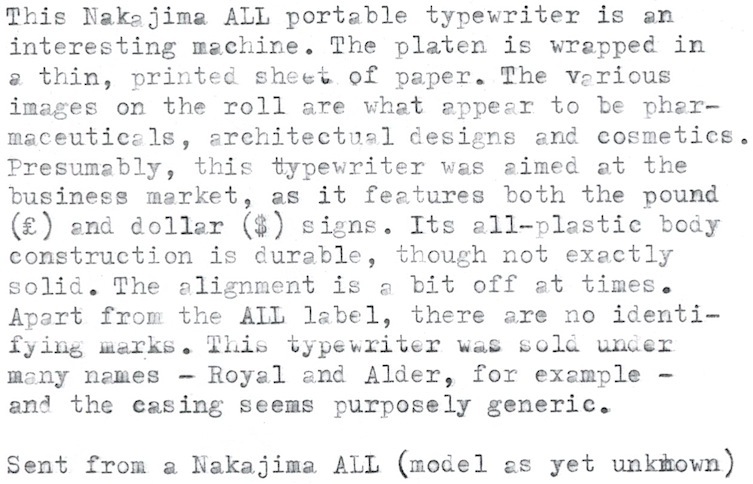 I could never have imagined that there’d be a typewriter with a platen covered with paper, let alone paper with a Japanese pop design print. 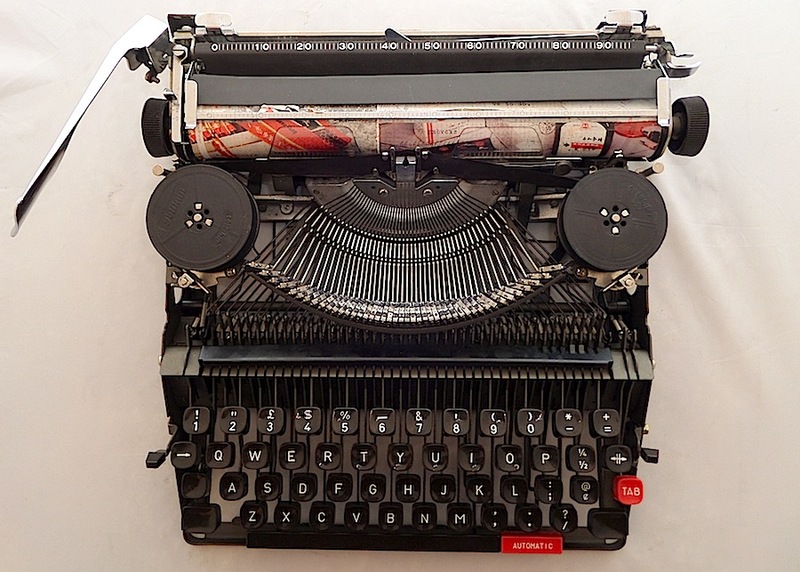 I wonder if the paper was meant to be peeled away before the typewriter is to be used, something that you should never do now, of course. 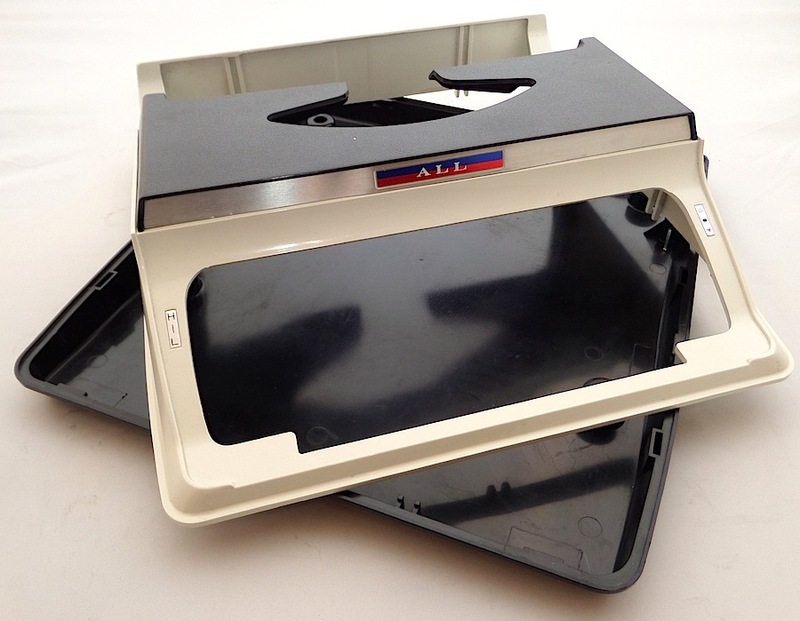 I’m not sure I would have purchased this machine if it did not have the paper-covered platen. Certainly unique. I can’t imagine that the paper is meant to be removed, as it fits very snugly around the platen. The previous owner even typed on it. I’ve ceased even typing on it entirely, as I fear the paper will peel further! If anyone reads Japanese, please translate. My first impression was that it was advertising, but then I thought, no, that would be tacky. But maybe it is advertising. How strange. 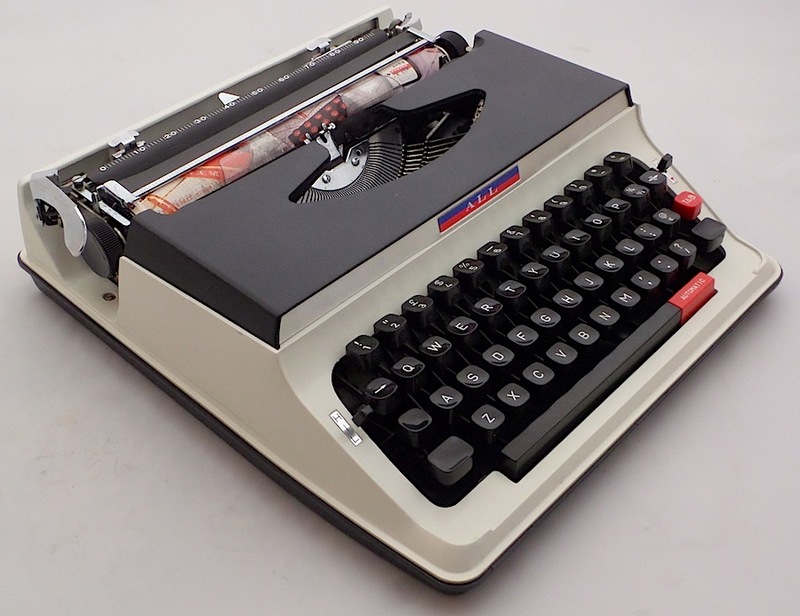 As the typewriter has both the dollar and pound signs, perhaps that places it in Hong Kong? Perhaps this was meant to protect the platen from typebar damage. 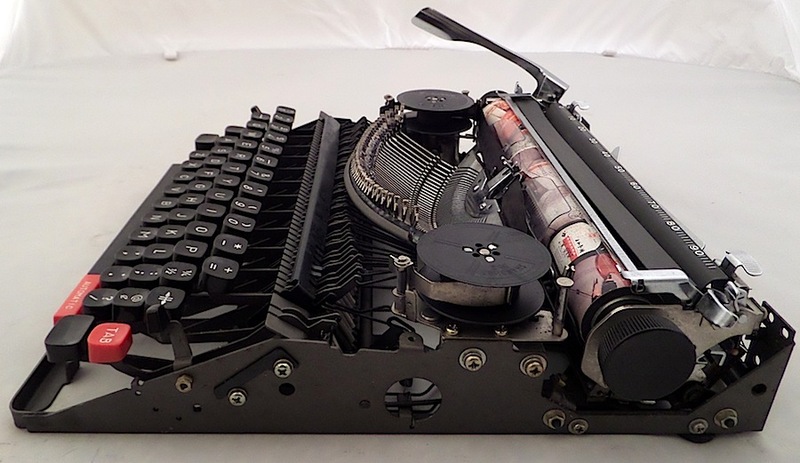 I remember seeing older typewriters in my school office with their platens wrapped in paper; and one of my machines, a 1948 Remington Standard, came with a big Legal-size page (with text dated 1971!) 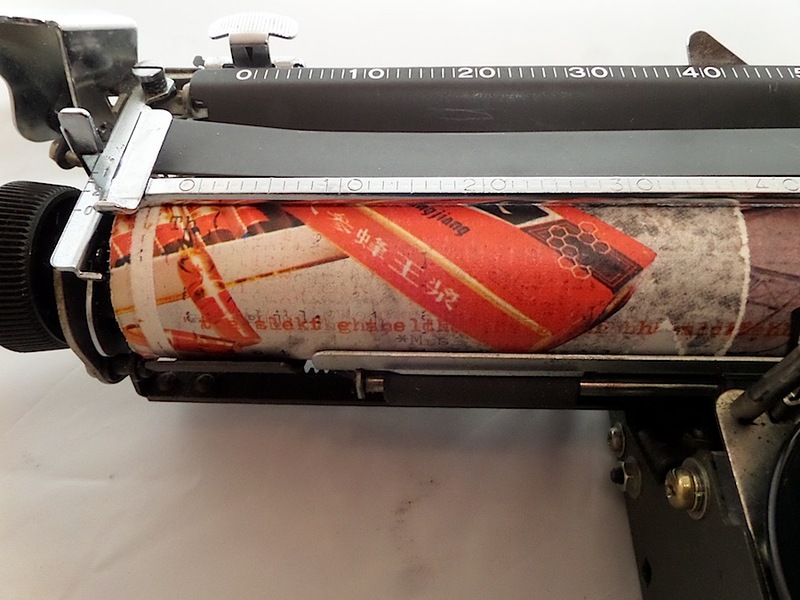 wrapped tightly around the platen cylinder and held in place with cellophan tape. When i removed the wrapping, the cylinder was immaculate: no dents, no cracks, not a single mark on it. 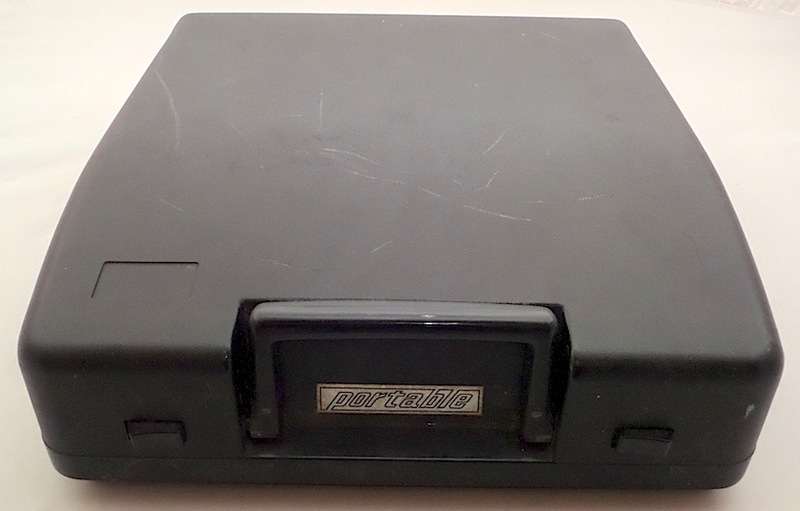 Were not for the fact that the rubber had hardened quite a bit, I would’ve thought it was a new platen. Perhaps that’s the idea behind this? 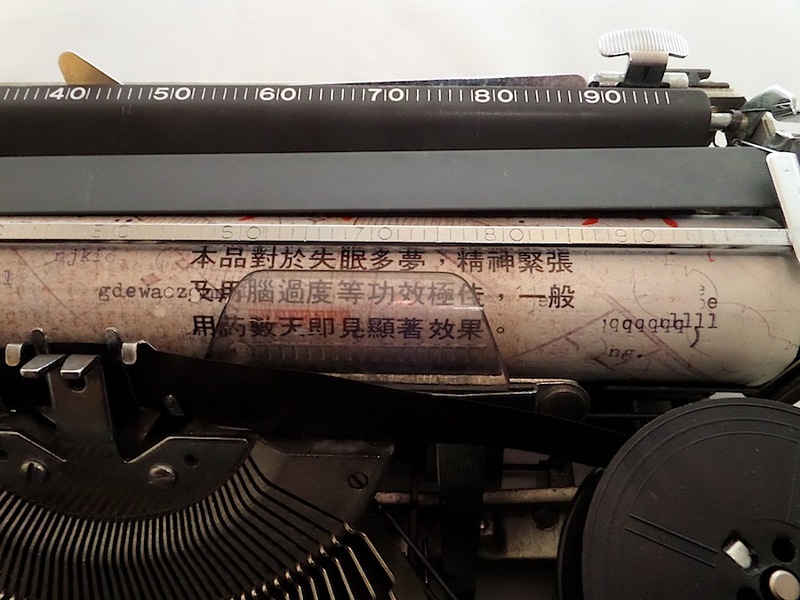 I mean, if those are actually ads for products sold somewhere in China, maybe the idea was to protect the platen and lenghten the useful life of this typewriter. Wow. It looks unused and very clean. I feel 99% sure that the paper was a temporary cover for the rubber platen. But keep it on! Found a Nakajima All model 550 in my fathers attic in perfect condition. Only problem is the carriage roller is locked, wont move. Does anybody know how to unlock/fix this? 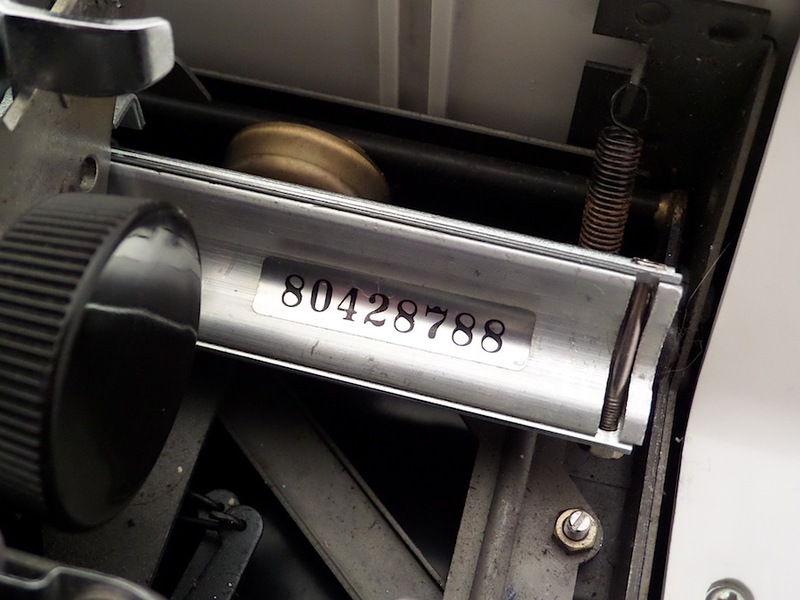 Would someone please tell me precisely what ribbon goes on my vintage Nakijima “Pentagon” typewriter?